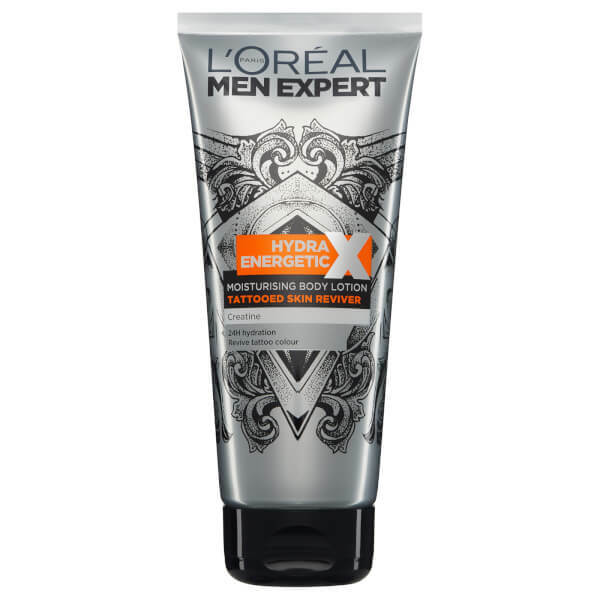 The L’Oréal Paris Men Expert Hydra Energetic Tattoo Reviver Body Lotion has been specially formulated to care for and enhance the appearance of tattoos. Providing 24 hour hydration, the non-greasy lotion absorbs quickly into skin and helps revive the colour contrast of tattoos. 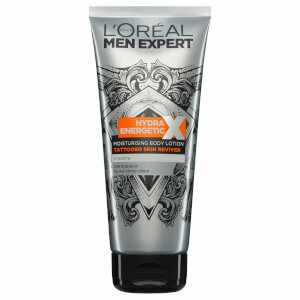 Enriched with Creatine, the hydrating, non-sticky solution takes care of tattooed skin and makes the most of your ink. Over time, aggressive soaps and UV rays can compromise tattoo appearance; ink can fade and contours blur. This reviving cream will help to prolong the vibrancy and definition of your tats. Suitable for daily use. Leaves no residue. Apply to whole body, concentrating on tattooed areas. Use daily for perfectly-hydrated tattooed skin. Do not apply to non-healed skin. Aqua / Water, Glycerin, Alcohol Denat., Paraffinum Liquidum / Mineral Oil, Cetearyl Alcohol, Elaeis Guineensis Oil / Palm Oil, Hydroxyethylpiperazine Ethane Sulfonic Acid, Mentha Piperita Extract / Peppermint Extract, PEG-100 Stearate, Stearic Acid, Creatine, Carbomer, Zinc Gluconate, Glyceryl Stearate, Dimethicone, Sodium Hydroxide, Myristic Acid, Palmitic Acid, Caprylyl Glycol, Xanthan Gum, Pentylene Glycol, Phenoxyethanol, Linalool, Alpha-Isomethyl Ionone, Coumarin, Limonene, Hexyl Cinnamal, Parfum / Fragrance, (F.I.L. B190638/1).